I haven’t posted much about my life recently, and so there suddenly seems to be an awful lot to talk about. I apologise for the length of this post, but I have, hopefully helpfully, divided it into a number of bitesize chunks. The past week or so has been pretty busy. Last Saturday, after roleplaying with Peter, we went to meet Colin – another RPG practitioner – and his girlfriend, Sally. 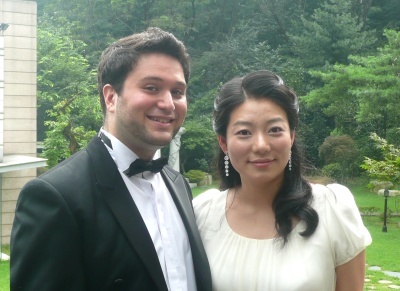 They’d travelled from London to a wedding in Japan, and from there to Busan, and up through Korea to Seoul. We met them the day before they were due to leave. We dropped Colin and Sally off at Gwanghwamun, where they assured us they could find their way back to their hotel. The traffic immediately thereafter was very bad – there were more protesters in the streets. The following week was the first of our summer schedule at the hagwon. The classes are a similar mix to the ones I’ve been teaching thus far – only there are more of them, and they start at 9 am – which latter fact is horrible. The children’s schedules are generally three fifty-minute classes followed by a thirty-minute ‘Free Talking’ class. In the weeks running up to the summer schedule the foreign teachers were asked to write plans for these classes; I don’t teach any of the beginner classes I wrote. Instead, I teach mostly advanced classes and a couple of intermediates. So my first experience of the free talking classes was teaching figurative language to Korean elementary students. Not the most promising of enterprises. That week I also got my first full paycheck – only it wasn’t quite as full as I’d expected. The total payment was low by 100,000 won and I had some large tax deductions. Later on, I was assured by Sunny, the head teacher, and ‘Kim Shiljangnim’ (who seems to be the go-to guy for any problems – but, of course, he doesn’t speak English), that the low pay total was just a mistake, and the tax deduction represented two months’ worth. I started the long, arduous, maximally bureaucratic process of sending some money back to my Lloyds TSB account to pay my credit card bill (last month I was awarded a late payment charge because I dawdled over scraping together £10 pounds towards the bill). I took out ₩600,000, filled out the Application for Remittance form and waited to be served. The clerk (a young woman called So-yeon; she was really quite nice – also quite hairy (in terms of arms and upper lip), but in a nice way) spent half an hour going through the motions, but then discovered that I needed an IBAN – an international banking number – for my account. Thwarted, I returned to work. Later on, I called Lloyds TSB’s International Banking Centre (having got the number off their website). On the first attempt they were closed. On the second attempt, I failed the security questions. On the third attempt, with some printouts of my account to hand, I acquired the number, which is GB12LOYD followed by my sort code and account number. Finally, yesterday, I completed the transaction. I managed to get the same teller again. And again, it took quite a long time. We chatted a bit (she spoke some English): she asked me if I worked at an academy; I asked her if she worked in a bank. Last weekend, I came to the conclusion that the reason many of my programs couldn’t access the internet was because of a firewall I’d installed and deleted earlier in the year – Comodo Firewall Protection. I’d subsequently discovered the uninstallation facility of Vista, but that didn’t fully uninstall it. So my computer had been thinking that it was still running. I tried tinkering with the system registry, deleting a few likely looking keys – and thus preventing my laptop from accessing the internet at all (and then restoring a back-up of the registry. I followed a guide on Comodo’s forum telling you how to get rid of the registry entries – with similar results, only this time the restoration of the registry failed to restore my computer’s internet connection. I determined to do a full reinstall of Windows. So, with my newly earned wealth I made a couple of trips to Yongsan I’Park to purchase a) a 300GB 2.5″ external harddrive and b) a copy of Vista Home Premium K.
On Sunday I went to Peter’s, and he and Mi Young helped translate and install Vista. It went pretty well. I haven’t installed all the drivers I downloaded, but I’ve got the display working, which is the main thing – things like the microscopic webcam and the fingerprint reader I can live with out. And, best of all, joy of joys, my internet is now fully functional. Last night I downloaded three episodes of Battlestar Galactica and watched two (I’d already seen them on TV, but I wanted to both catch up a bit and complete my collection). At one point during the week, while chatting via meebo.com in a PC room, Peter asked me to make a speech at his wedding dinner that Saturday. He’d already got someone to make a speech, but then discovered he needed three of them. I agreed, somewhat apprehensively. When it came to the early hours of Saturday morning, I still hadn’t written anything, though I’d done a little research on the internet for the kind of thing I should say. I wrote a page – eventually. Later on that morning, after another night of scarce sleep, I went into work in my suit (oh, yes – the previous week I’d found a couple of dry cleaners to get my sweat-impregnated suit jacket cleaned. One of them was closed and the other would take a week. So I washed it by hand, gently kneading it in the bathroom sink. The water went brown with three and a half years of dirt. I left it to drip dry on a hanger. It dried reasonably quickly and with only very slight creasing. I also bought an iron from Lotte Mart and ironed it and my trendy white shirt on a towel on the coffee table. As ever, the shirt didn’t iron very well, and ended up looking slightly more creased than it’s supposed to. But I digress) and the Korean teachers – all female – went ‘Ooohh’. I took a taxi from Eunhaeng Sagori to the venue a place called Han’s Gallery, which took about half an hour and cost about ₩11,000 (by far the most expensive taxi ride I’ve had in Korea). The event was actually being held in the restaurant adjacent to the gallery. I met Peter and Mi Young, the former looking kind of strange in his tuxedo (his usual attire is rather on the scruffy side of casual), the latter looking very nice in a pearlescent cream dress. The guests were made up of their friends and colleagues – no family this time around (future family-inclusive events are predicted). While taking some photos in the grounds, I did something incredibly stupid. I stood on a wet boulder to get a better vantage – and my foot went shooting out from under me. I broke my fall with the hand holding my camera and the camera went clattering on the rocks. The total damage was fortunately superficial: I got mud up my sleeve, a couple of grazes on my middle finger, and my camera gained a few scratches too. 저는 Sean 입니다. 한국아 잘 못해요. 영어 하겠어요. Once all this was done, Peter and Mi Young cut the cake and fed each other a slice. Ahh. Later on, as people were eating, Botond and So-young, arrived (Bo had had classes up until 12:25; I’d swapped out of my 11:00 class). We hung around as people left, and we and a few others went for a few drinks at a place in Hyehwa. And after that Bo, So-young, Peter and I (Mi Young wasn’t feeling well, or was tired) went to a singing room (ie, karaoke). And we stayed there singing, with varying levels of proficiency, for a couple of hours. When I got home, I was already in hangover mode. After trying to sleep for a bit, I got up to be sick and took some aspirin, paracetamol and ibuprofen for my piercing headache. In the morning I was fine. And that’s about all I have to say for the time being. Visiting George R R Martin’s newly refurbished blog today I found a link to this piece on Robin Hobb’s website – on the subject of the pernicious evil of blogging.